Rub pork with dry rub, smoke at 225 degrees until the meat reaches an internal temperature of 165 degrees. Wrap and continue to cook until the internal temperature reached 185 – 190 degrees. Shred pork using meat claws to create big chunks, medium chunks and small chunks. 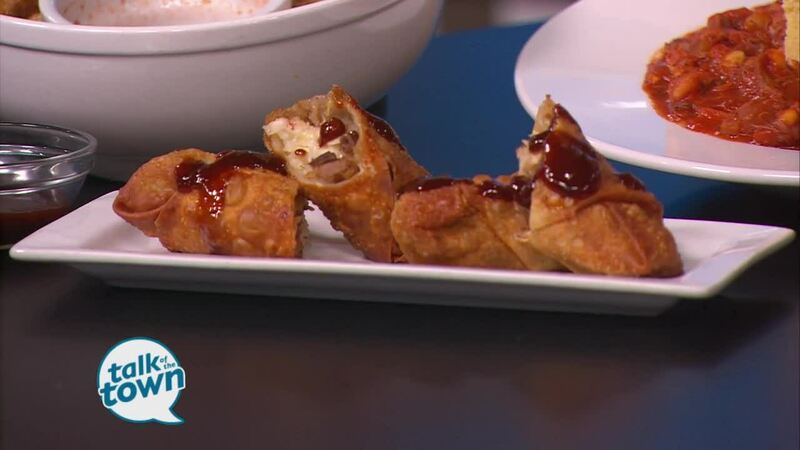 Put approximately 3 ounces of pork on an eggroll, top with 1 ounce of cole slaw, wrap it like an eggroll (diamond shape facing you) roll ends and seal with egg wash. Cook in fryer for approximately 2-4 minutes, rotating with tongs until golden brown and an internal temperature of 165 degrees. Serve with peach bourbon bbq sauce. Season peaches with salt and pepper to taste, and covered with oil, grill peaches until they start to caramelize. Add one shot of bourbon, blend peaches, bourbon, and bbq sauce with immersion blender.